Kellogg Community College’s Bruin Bookstore is collecting gently used athletic shoes for donation and worn out athletic shoes to recycle as part of a Sneaker Collection campaign during the month of April. The bookstore, located on the first floor of the Lane-Thomas Building on KCC’s campus at 450 North Ave., Battle Creek, will accept the shoes through the end of the month during regular business hours, which are 8 a.m. to 5:30 p.m. Mondays through Thursdays and 8 a.m. to 4 p.m. Fridays. 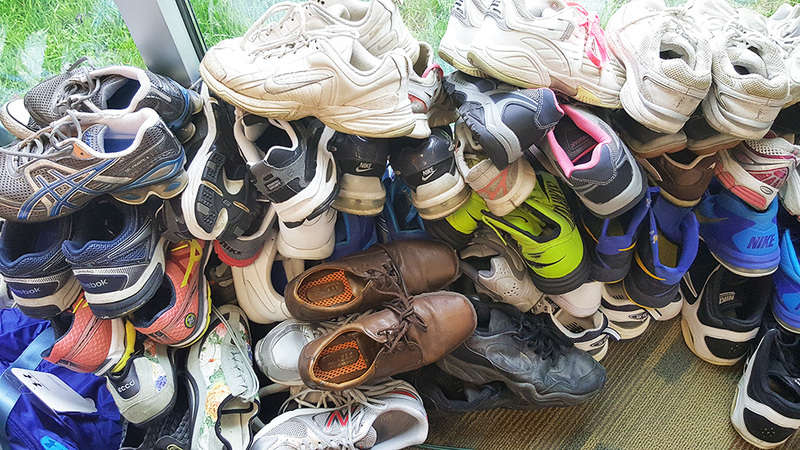 This is the sixth consecutive year the bookstore has held the Sneaker Collection event, which over the past five years has collected more than 400 pairs of gently worn shoes for donation and unusable pairs for recycling. The Sneaker Collection is one of many community collections undertaken at the Bruin Bookstore each year, which include an annual Hoodies for the Homeless shirts and coats collection each fall semester. An eyeglasses collection held each March since 2016 at the bookstore has resulted in more than 650 pairs of used eyeglasses collected for donation and recycling through the Lions Club Recycle for Sight program, including 179 pairs collected last month. The Sneaker Collection initiative also corresponds with the Bruin Bookstore’s Annual Spring Sale, during which all KCC clothing and gift items are 20 percent off for the entire month. For more information about the KCC Bruin Bookstore’s Sneaker Collection campaign, the Annual Spring Sale or other KCC bookstore initiatives, contact the bookstore at 269-965-4128. General information about the Bruin Bookstore, including key textbook dates for students, is available online at http://bookstore.kellogg.edu. Pictured above are shoes donated during a previous Bruin Bookstore Sneaker Collection campaign, shot by bookstore clerk Kari Barton.